You know the feeling, you get home from a trip to one of the Disney parks and realize that you forgot to purchase that one souvenir that you were going to buy at the Emporium on the way out of the Magic Kingdom! Or maybe there is a special event that celebrates your favorite attraction, the Haunted Mansion, and they will have a limited number of items for sale, but you won’t be back to Walt Disney World for another 3 months. You could attempt to call the Disney merchandise phone line to see if they can assist you or you could also look online, but there is a third option that is a little more fun (and sometimes it might be the only option), a long-distance Disney shopper! Today I would like to welcome two guest-bloggers to my blog, Fran Cassano, author of the Practically Perfect Disney Crafting blog on the WDW Radio website, and Makena Wolcott, author of WDW Radio Week in Review, Meet the Box People, and numerous stand-alone blogs on the WDW Radio website!! Fran, Mak, and I recently used the long-distance shopping technique and would like to explain the process, give you some ways this could be challenging, and also see if this is an option that you would consider. MAKENA: “My first trip to Disneyland is coming up and, if you know me, you know that I love doing my research on places before I go. While doing my research, I fell in love. There are two things in Disneyland that we don’t have in Disney World that I slowly became obsessed with. If you have been reading my blogs, you know that I recently did one on the Soundsational Parade located in the Disneyland Park. This indeed is the source of one of my Disneyland fascinations. I just love the theming, colors, and of course the music! The other attraction that has captivated my interest is located at Disney’s California Adventure, and that is the Mad T Party. Disney took a huge risk with a great payoff with a live band performing a mix of old rock and modern pop. The cover choices are great and the attention to detail, characters and costumes is amazing. Think steampunk Mad Hatter and Alice guarded by an intimidating duo of Tweedle Dee and Tweedle Dum. Not to mention, Drew Tablak as the Hatter makes any day brighter (but that’s a blog unto itself)!!! 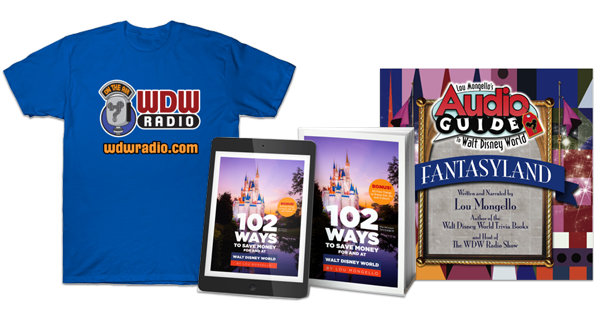 I know that my trip to Disneyland is in just a few short weeks and I had my souvenir list all ready too, but members of my WDW Radio family were heading to California even sooner than I was. Could I get a head start on my shopping? As for the Mad T Party, it actually started with a tweet. One night, I jokingly tweeted “Is anyone willing to buy Mad T Party merch for me? I will pay you back.” I really did not expect a response. All of a sudden, I got a response from Alyssa Wiseman (AJ), saying that she was willing to buy me something. At first I was like “Wouldn’t that be cool if I could actually take her up on that offer?” but then I thought about it and asked my parents, who initially told me not to interfere in her vacation. They were finally convinced that it wasn’t a big imposition when AJ told them she would love to do it. Once I got the thumbs up from my parents, AJ and I talked about it over the next few weeks and finalized the little details. Initially I requested a shirt, pin, and vinylmation but that list grew as her vacation came closer. Part of the reason my list grew is that my vacation is in November and I am very afraid that the Mad T Party will die before then. There are rumors of it going away soon, and I am crossing my fingers that it will remain right where it is. Anyway, I didn’t want to miss this golden opportunity to get merchandise from a great show that I enjoy watching (online even if I never get to see it in person). My hunt for Soundsational mementos started at the New Jersey meet when Fran Cassano (Fran) actually offered to be the messenger and buy me something. At first I thought that I would just say “oh, don’t buy me anything” but that would be the waste of a great opportunity! I asked her to purchase one Soundsational Parade item for me because I knew it would be kinda out of the way and I could look forward to receiving something in the mail (I just love that)! Since I will surely be able to see the Soundsational Parade in person, I wasn’t going to be specific – anything that Fran found would be fantastic. Eventually the week that both women went to California arrived and I was glued to my phone and computer. I awaited updates from them on their Disneyland adventures before the Expo even began. Sometimes they were to keep me posted on my purchases, and other times it was just about all the fun they were each having (and once it was even a photo of AJ and Fran together)! AJ even broadcasted the Mad T Party performance live for me one evening and, as an added bonus, walked me around Carsland while waiting for showtime! As you can see in the picture, AJ’s stash arrived and included a t-shirt, pin, vinylmation, tumbler and scarf (as well as some stuff from the D23 Convention)! It felt just like Christmas morning! As if it couldn’t get any better, Fran’s package arrived with an unexpected surprise. Fran picked me up a mystery box of two Soundsational Parade pins! Imagine my delight when I opened them to find both a Mickey and a Minnie parade pin! ALYSSA: Mak was absolutely correct about how the entire experience brought us three ladies together for this trip. While Fran and I were having a wonderful time at the parks and D23 Expo, we also wanted to share some of our experiences with Mak and updated her frequently. FRAN: “Hi Everyone! I also had the happy task of shopping for Makena on my Disneyland trip. I think the only challenges in finding her request were item location and maybe design/pattern. One thing we did discuss was her concern that her item may have been (or will only be) available for a limited time. Mak asked me to find her a pin trading pin of Disneyland’s Soundsational parade. I found a blind box two-pack of them at the Westward Ho Trading Company in Frontierland. It felt like Westward Ho was the only shop that carried Soundsational pins (or anything Soundsational, at least from what I could tell). At first I wondered if I found them at Westward Ho Trading Company because casual pin buyers wouldn’t think of looking for parade-based pins in Frontierland. Main Street felt like a more obvious shopping choice for Mak’s request. But Westward Ho seems to be a favorite of avid pin collectors and they are known to carry a wide variety of pin designs there, including parades. I think it also really helped having such wonderful Cast Members assisting me (they reminded me a lot of the CMs at the information desk at the World Of Disney in WDW who locate an item or size for you). I really enjoy shopping for friends and family, especially when it takes me to new shops I wouldn’t normally discover, like Westward Ho. ALYSSA: As you can gather from both Fran and Mak, the process was easy and fun for both the shopper in the park as well as the purchaser at home. My opinion of this idea was this: it was wonderful to shop for Mak because it led me to experience a show that I probably would have overlooked! PS: don’t ever think that Mad T Party isn’t worth watching. We were in constant contact with each other and I sent pictures of each item that I was purchasing for her before I made them. I did not want to purchase anything before having her permission, especially if it wasn’t on her list (Mak had prepared a list of items, with pictures, which she was particularly interested in me buying). Another aspect of this idea is how payment is going to work, because let’s face it: some Disney merchandise is expensive. When Mak mailed me her “shopping list” she also included a check for the estimate of what her merchandise would cost and also said that if the total price was higher, another check would be in the mail. I never had a worry or doubt that I would get paid back for the items I purchased, but I could understand how that could be a fear for some. I would recommend that you know the person well before deciding to be their long-distance shopper. Overall the plan worked for us and also was a lot of fun! Hopefully when Mak gets to Disney’s California Adventure in November, the Mad T Party is still celebrating their “unbirthday” and she will be able to sing along! I know that Fran enjoyed catching the parade and then going on her search for the Soundsational Parade merchandise and it took her to a new frontier……sorry bad pun! That is all for this week, but I would welcome your comments and questions about this, or any merchandise, topic. Have you ever long-distance Disney shopped for someone before and what were your experiences? Or, do you have a worry or setback that you could see with this process? Have a wonderful couple of weeks everyone and keep shopping Disney style! Photos from personal collection or were taken by Makena Wolcott and are used with her permission. Alyssa Wiseman (also known as ajwiseman09 in the box) and her husband Brandon reside in central Indiana (too far from Disney) with their 4 year shih tzu London Bridget and Bulldog, Maggie Mae. Alyssa and Brandon enjoy traveling to Disney several times a year to see what is new and enjoy classic Disney. 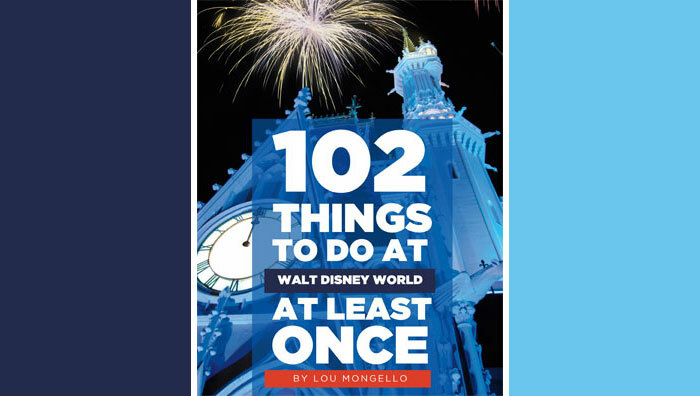 While traveling, and at home, Alyssa is frequently shopping for Disney products and making a list of items to buy while in the parks. Please follow Alyssa on twitter @ajwiseman09. Thanks AJ and Fran. When it came up about shopping for Makena, I was against it as I did not want us to impact your vacation. However, between your kindness, and Mak’s persuasion, I caved. I am relieved in reading that it had a positive impact on your time. And, I sensed eagerness and excitement from you during some of the pre-planing operational discussions that was had with my daughter leading up to.it.